TOTALLY REMODELED 55+ COMMUNITY. Come see this fantastic remodeled home with an open concept floor plan. This model features two bedrooms AND an office/study, open kitchen, PANTRY, dining and living room. The bathrooms have natural stone tiling with a contemporary look. The house has gorgeous wood laminate flooring throughout. 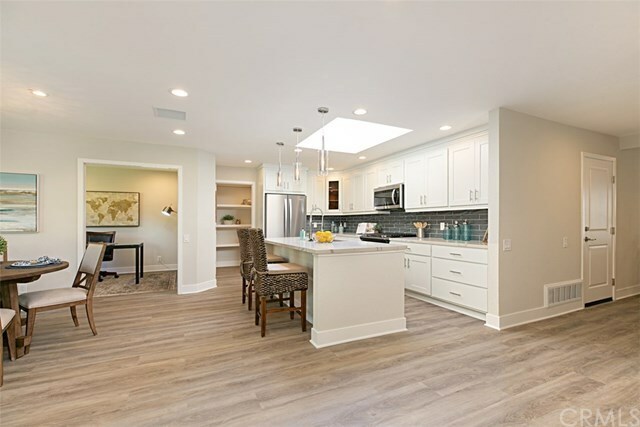 The kitchen features brand new soft-close cabinetry, quartz counters, stainless steel appliances, and a kitchen island that opens to all living spaces. The outdoor area features an over-sized backyard patio with separate private side patio area. This home has a hillside view with lots of privacy and is close to Rec Center - featuring amenities such as Lawn Bowling, Tennis, Pool, Spa and Garden to name a few. You will not be disappointed by this beautiful home.